When the weather turns warm, patios often do double and triple duty as kitchens, dining areas and living rooms. Since your family and friends spend so much time in your outdoor space, consider giving your patio a refresh with some inexpensive touches. Be playful with fabric, lights, color and texture, and add unique finds that work outdoors. You may just never go back inside again. 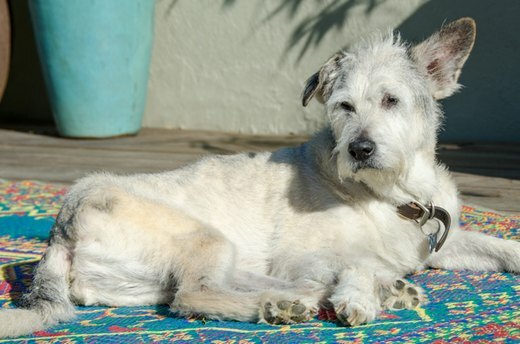 Adding an outdoor rug to your patio can create a more intimate and inviting space. Select from neutral solids or big bold patterns, and consider materials such as sisal or grass. For smaller patios that have less-than-attractive flooring, consider covering cement or old wood with composite deck tiles that easily snap together, says Cyndy Aldred, the creator of the home decor blog, The Creativity Exchange. "They hold up in any weather condition and they give a beautiful deck look," Aldred says. Nothing says summer romance more than a string of large white bistro lights specially made for the outdoors. Hang and crisscross strings across the corners of your patio, or from your roof to a nearby tree, Aldred says. Tiki torches are also a great way to create a festive mood. Aldred likes to put smaller torches in planters and place them strategically around her pool area. For quick lights, place tea candles in small votives or secure them in white paper bags that have been weighed down with sand. A number of outdoor pillows, chair covers and tablecloths with varied patterns are on the market, but if you can't find one that you like, you can easily make your own by spraying a regular pillow or cloth with two to three coats of a fabric and upholstery protector that repels water, Aldred says. "They always hold up beautifully through the rain." 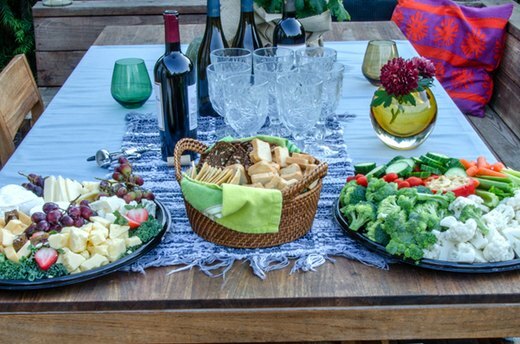 An inexpensive way to transform your outdoor space is to use spray-paint on your old patio furniture, planters, candle holders and trays, Aldred says. Select colors that complement your home's exterior and play with pops of bright colors to break up any monochrome. It's a great way to get creative without buying anything new, she says; "The best thing about spray-paint is that you can pick a new fun color every year and really transform your outdoor areas." 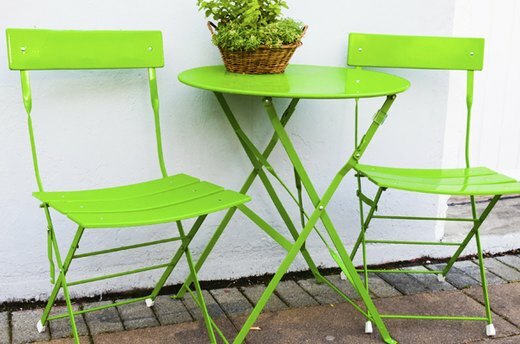 Outdoor decor can be tricky since pieces should be durable and blend well with your patio look. Consider metal or iron art pieces you can hang on your exterior wall, or make your own wind chimes from shells, stones or glass. Natural items such as plants and stones are also a great way to add character to your patio. "I am in love right now with succulents and I have them everywhere around my pool patio," Aldred says. She also uses large rocks and places them around planters. Plastic and melamine dishes aren't what they used to be. There are so many different designs and shapes to choose from, including florals, graphic prints and hand-painted designs. Be creative with your food containers, Aldred says. 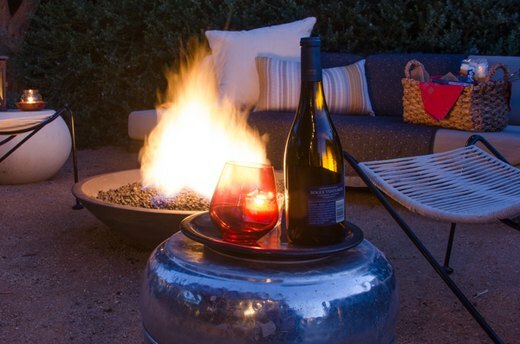 She likes to fill large cement planters with ice and use them to chill wine and beer. They're also great for holding bags of chips for an outdoor buffet, she adds. An inexpensive way to create outdoor furniture is to find wood pieces that you already use inside the house, and spray them with several coats of a matte polyurethane to seal them from the elements, Aldred says. 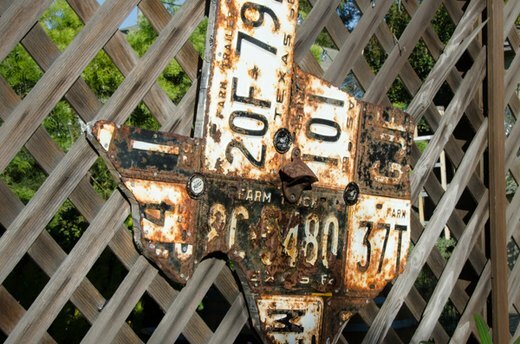 If you have metal furniture, leave it as is and you can later paint over any weathering that happens, she adds. 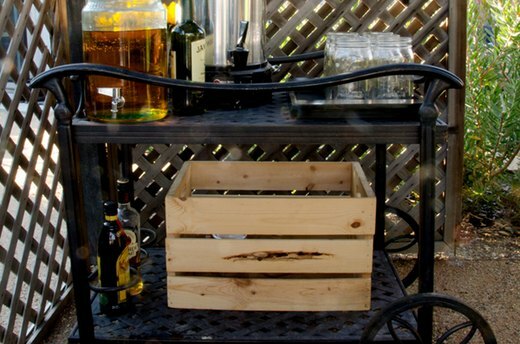 One of Aldred's favorite patio furniture projects was transforming a potting bench into an outdoor bar. The hammock is the epitome of a lazy summer day. Whether it's made of rope, fabric or a mat, hammocks are a great way to add casual seating and a secret place to snooze. 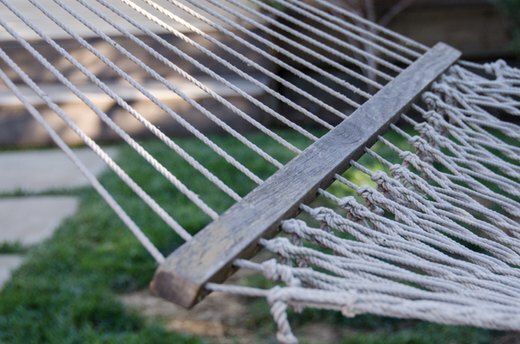 To avoid an embarrassing fall, remember to first sit in the hammock as you would a chair, then reach behind and spread the hammock before you lie down, according to Swings and Things of San Diego, a hammock retailer. An outdoor hearth is both inviting and useful. 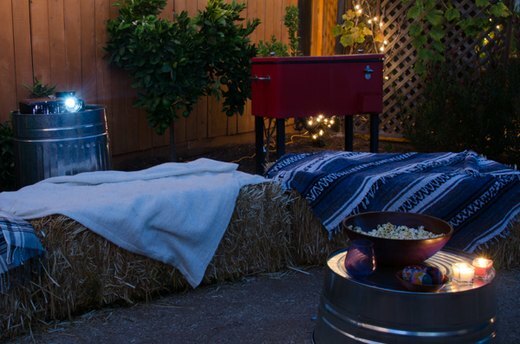 Sit around the fire with friends or let your kids roast wieners in their own backyard. For the easiest do-it-yourself fire pit, Aldred suggests digging a hole in the ground and stacking the sides of the pit with bricks that can withstand high heat. Place stacks of wood on the dirt in the hole, and you have an instant s'mores machine. For a more finished look, "line the area on the top around the hole with flagstone or ground pavers," Aldred adds. 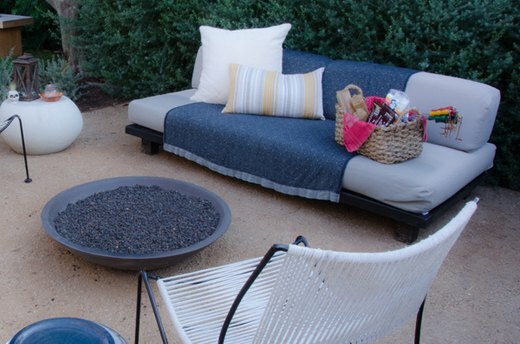 Don't neglect your storage options as you breathe new life into your patio. An old wooden milk crate is an attractive bin for toys, or stack several crates to make a shelving unit. 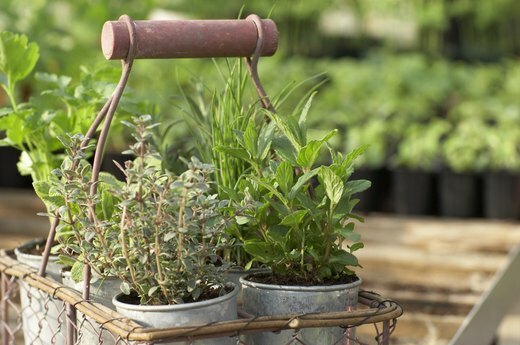 Wire baskets can keep your gardening tools orderly, and a small stepladder is a great way to hold and show off your plants.